Save Water – Go Vegetarian! 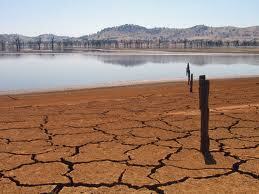 Severe droughts have recently made water scarce in several regions of the country. Parts of California, the Southwest, and the Great Plains have suffered from three consecutive years of drought, according to Brad Rippey, meteorologist for the U.S. Department of Agriculture (USDA). More than two-thirds of California is currently covered by extreme drought, according to the U.S. Drought Monitor. Of course, drought directly impacts crops. Agriculture uses about 80% of California’s water and because of shortages, a lot of fields may have to lay fallow this year. It’s not just California that’s experiencing a drought. Kansas, the biggest U.S. wheat producer, and elsewhere in the Great Plains are also experiencing a severe drought. What can we do about it? After all we can’t change the weather. True, but we can change what we eat and it turns out that may be more effective than anything else. Eating vegetarian foods saves a huge amount of water because producing meat is so water-intensive compared to plant foods. Unfortunately, local officials seem to be unaware of this. They suggest, among other things, that we install low-flow toilets, cut down on the length of our showers, and remember to turn off the faucet when brushing our teeth. But it is rare that any of them suggest that we take a look at what we eat, despite the fact that what we eat has by far the biggest impact on the amount of water consumed overall. So, let’s do some math and add up the potential savings. It takes about 5,200 gallons of water to produce a pound of beef, about 1,700 gallons of water to produce a pound of pork and about 800 gallons of water to produce a pound of chicken. Now let’s say on a given day that a person chooses to eat a 4 ounce serving of beef, a 4 ounce serving of pork and 4 ounce serving of chicken in a day. They would use up about 1,300 gallons of water in the beef production, about 420 gallons of water in the pork production and 200 for the chicken production, giving a grand total of 1,920 gallons of water in just one day. On the other hand, it takes about 530 gallons of water to produce a pound of soybeans, about 370 gallons of water to produce a pound of corn and about 230 gallons of water to produce a pound of wheat. Now let’s say a vegetarian chooses to get his nutrition from plant sources such as tofu, wheat and corn and uses 4 ounces of each ingredient during the course of the day. He would use up about 132 gallons of water through soy production, about 92 gallons of water on raising corn and about 59 gallons on the production of wheat, giving a grand total of 283 gallons of water. He therefore saves 1,637 gallons of water over the meat-centered diet every single day. Compare this to common recommendations for water conservation. One can save about 10 gallons a day by using a water efficient toilet, 2 gallons of water a day by using an efficient bathroom faucet, 25 gallons of water a day by taking shorter showers and using an efficient nozzle, 4 gallons of water with an efficient dishwasher, and 16 gallons a day with an efficient washing machine, giving a grand total of 57 gallons of water per day. Now saving 57 gallons of water is a day is good, and it is right that those savings are pointed out. However, the greatest impact is from the 1,637 gallons that could be saved by switching to a vegetarian diet. Here in the Northwest, many people may understandably be less concerned with saving water than in other areas of the country. But consider that much of our food comes from those other regions, and that even here in Washington, much agricultural land is in the center of the state which receives much less rainfall. Switching to a vegetarian diet is a change that has a powerful effect on the environment. In addition to saving large amounts of water, our diets help save the rainforests, reduce soil erosion and water pollution, and fight global warming. A vegetarian diet is the single most environmentally friendly lifestyle choice a person can make and is so delicious it will leave a good taste in your mouth.